Some hobbies are done alone, they're peaceful and tranquil affairs. A time to take a break from the crowds and indulge in something soothing. Not so if your favorite pastime is full contact sword fighting and your a paid up member of a Medieval fighting club. Quite the opposite, in fact. But supposedly it is a hobby that people like to do as you'll see in this video. Men, and it appears to be all men in the video anyway, get dressed up in body armor and helmets and then attack each other with steel. Delivering brutal blows and swings to the body and head for around two hours of relentless fighting. A whole motley crew of Medieval weaponry is available, and while these instruments of destruction do appear to be blunt, so they can't pierce through the armor, there's no doubt that plenty of bruises, possibly broken bones and concussion too, will be on the menu for those taking part. The guys fighting in this video appear to be from Eastern Europe but it takes place in many other parts of the world as well. 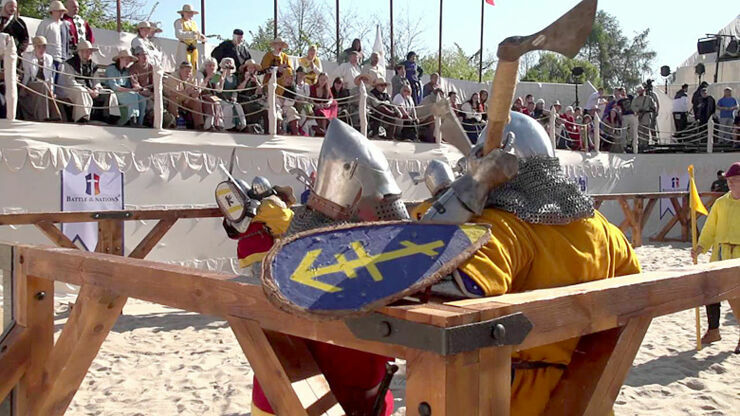 In fact there is an International Medieval Combat Federation which was founded in 2013. Member countries include: Poland, Germany, USA, Great Britain, Denmark, Italy, Spain, Portugal, France, Luxembourg, Quebec, Ireland, Japan, Latvia, Belgium, Australia, New Zealand, South Africa, and Mexico. Since 2014 they've been holding the annual IMCF World Championships. There's also the older and more prestigious Battle of the Nations which has been held yearly since 2010. This year it was held in Prague and it features fighters from various nations battling in tournaments, sometimes in teams, sometimes one on one. All in all it seems like a hobby not for the faint-hearted—or the brittle-boned.